The 112 is a crazy mess. That's not to say it's a bad bus (not really, at least), but if you look at the interactive street map of the route on the MBTA website, you can see how many twists, turns, and detours it makes along its route. It is one of three buses that connects the Blue Line to the Orange (the 110 and the 411 being the others), and the only one that doesn't leave from Wonderland. That said, it leaves from Wood Island, which is certainly not a hub at all, only serving the 112, 120, and, in the morning, the awful 121. When I got on the bus, completely aware of its insane route, I wasn't entirely expecting about 10-15 other people joining me. We soon left the small Wood Island busway and headed for Eagle Square, turning onto Neptune Road, and then Chelsea Street. As I mentioned in my 121 post, Eagle Square seemed to be a bunch of large, mysterious vats. We went by a lot of these on the 112 before going on a bridge over Chelsea Creek, entering Chelsea. I tried to take a picture of the (only decent) view, but as usual it came out blurry. 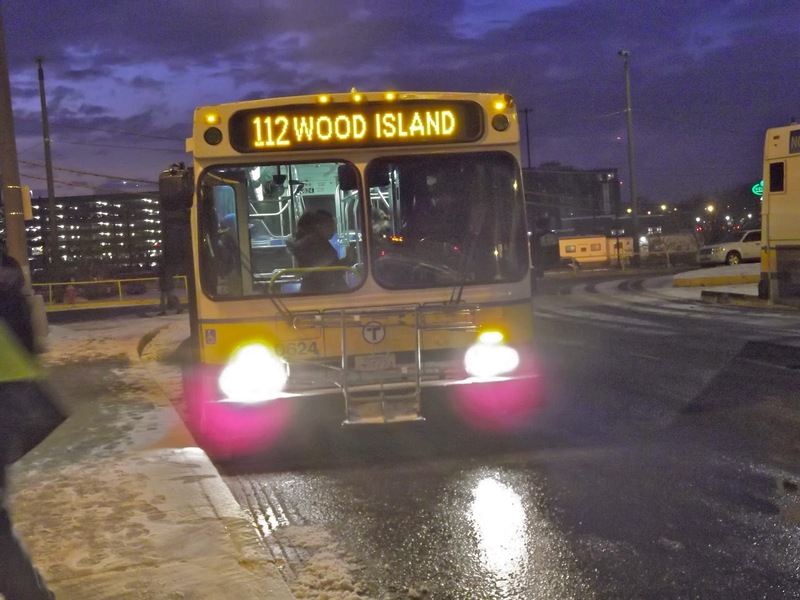 I normally don't like side-view photos, but this one of the 112 at Wood Island shows the blatant product placement on the destination sign. After going over the bridge, we made a slight turn onto Central Ave and it soon became residential with closely spaced apartments. We entered downtown Chelsea and businesses started popping up. We turned onto Hawthorne Street, which becomes Broadway at Bellingham Square, then we turned onto Fay Square, and again onto Washington Ave (closely missing the Commuter Rail station), then onto Broadway at Bellingham Square again, and then onto Everett Ave, going under Route 1, still part of the Tobin Bridge over here. Confused yet? It took forever to get out of downtown Chelsea with the route the bus takes through it. And the craziness doesn't end there. Soon after going under Route 1, we turned onto Spruce Street and went through another industrial area. After crossing over Williams Street, Spruce becomes "Commandants Way" as we entered Admiral's Hill. I couldn't really tell what it was from the bus, but I concluded that it's half old folk's home, half gated community. Someone correct me if I'm wrong. We turned onto "Captains Row," going by some large residential buildings before turning again onto "Boatswains Way" and going by some very similar houses. A few people got on and off at one of the large buildings, but we soon turned back onto Captains Row and then Commandants Way, heading out of Admiral's Hill. But before heading back to Everett Ave, we pulled into the Mystic Mall, made a strange loop around the parking lot, and made the "Market Basket" stop. A whole bunch of people were waiting here, maybe 15 or so. After crossing the Commuter Rail tracks, it got pretty industrial. We made it about three blocks in this area, though, before making yet another detour to Quigley Hospital. We went down Route 16 at fast speeds before turning onto Washington Ave (the same one that goes to downtown Chelsea, apparently) and following the 111 for just a block or two. We then turned onto Jefferson Ave, then Franklin Ave, then Warren Ave and went through a residential neighborhood. We soon made a sharp right turn onto Summit Ave, dropped someone off at the hospital, and then went back the way we came. The route finally gets normal after this, turning onto Everett Ave for a short time, and then turning onto Chelsea Street (into Everett, somewhat ironically). It's a residential neighborhood, but there are businesses once we turn onto Broadway and join up with some other buses to Wellington. We soon got onto Route 16 and made the final pseudo-express run (there's nothing to really skip) over the Mystic River and into the Wellington Station busway. I much prefer this picture at Wellington. Ridership: The initial burst of people at Wood Island seemed to be all locals, just getting home. The people that got on at Market Basket mostly got off at Wellington, suggesting that they use this bus to get to the Orange Line and they live elsewhere. I don't believe anyone took this from beginning to end, though, as I can imagine. Overall, about 40 people rode. Not bad. Pros: It serves a lot, although mostly via long detours. It does seem to be very well-used, though. It's only one of two buses to directly serve the Market Basket (the very limited 114 from Maverick being the other). 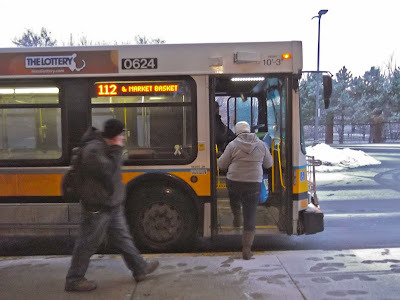 The 112 has the edge, seeing as it runs 7 days a week, and connects to the Orange Line as well as the Blue. This seems to pay off based on the number of riders using the Market Basket stop. Cons: Are all the twists and turns really necessary? The Admiral's Hill and Quigley Hospital detours had very limited ridership, and it seems the 112 could do a much simpler route through downtown Chelsea (though perhaps I'm making that up; the street pattern over there seems pretty complicated). Also, the schedule is definitely not the best. It runs every 40 minutes weekdays and Saturdays, and every 50 minutes on Sundays. It is admittedly better than some other buses, including the 114 that also serves Market Basket, but I feel it could definitely be improved on based on the ridership I saw. Nearby and Noteworthy: Downtown Chelsea seemed to be the friendliest place along the route. Eagle Square is an industrial wasteland, there's nothing really around Wellington, and Market Basket is...Market Basket. Yeah, it serves a lot and it got a lot of ridership. But the schedule's pretty bad and, more importantly, the route is so twisty! Consider that the "snow route" of this bus omits the Admiral's Hill and Quigley Hospital detours. What if they made it so that every other bus operates straight through (though still serving Market Basket), and then the others serve Admiral's Hill and Quigley Hospital. I feel that would make a lot of sense and make the 112 a somewhat better connector between Blue and Orange. Currently, though, the 110 is definitely the better option, at least if you're leaving from Wonderland. Latest MBTA News: Nope, nothing much. Sorry. It takes an odd routing in Bellingham Square because of how the traffic is handled and how the streets are laid out. They predate buses and even trolleys by almost two centuries, and was even worse before the 1960s when the city changed the streets to one way only between Chelsea Square and Chelsea City Hall. Since it is the only east-west route it has to take an odd route via one-way streets to get to Everett Avenue, the only alternative would be to reroute it via Marginal Street but that would cost almost all of the ridership as it misses both Bellingham Square. And Admirals Hill is just what you said it was- a mix of gated community and old persons' housing. It's also the only way many of them can get access to the shopping center which is also a major draw for ridership for the route- thus it is mentioned in the signage. And it's not always busy, in fact it's the lightest used of the 7-day routes in Chelsea. 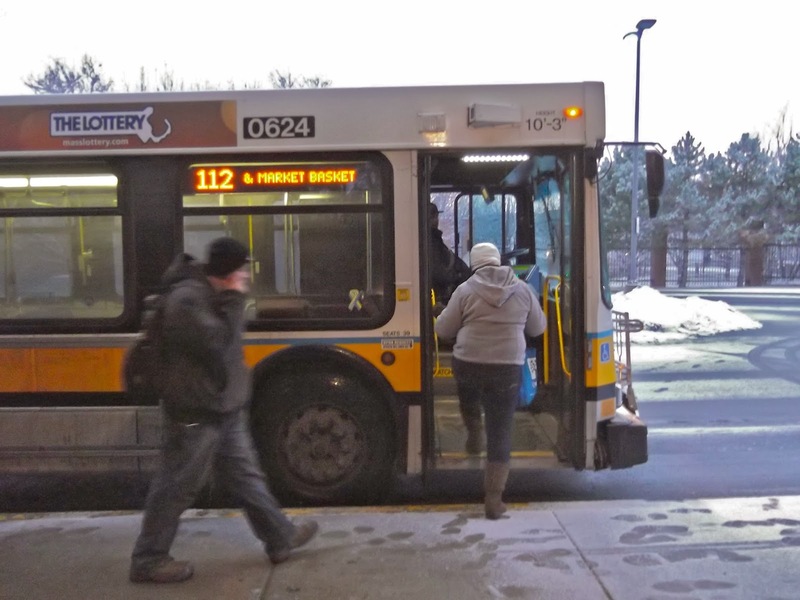 Its main source of ridership is the elderly, disabled, and low income people who need it to access the shopping centers it passes by in Chelsea and Everett. Interesting. So based on its main source of ridership, it should actually run more often during off-peak hours to serve the people going to the malls...unless it's used at rush hour? The weekday 114s provide the additional weekday support for riders in Chelsea and the 110 which shadows it for all but three blocks within Everett., all other times ridership is simply not enough to justify more runes despite it being the only accessible route for the residents of The Soldiers Home and Admirals Hill. It should be getting some additional support in the next few years when the Silver Line is extended to the shopping center. It's an odd route, one that serves a purpose but simply isn't strong enough on its own to receive more service. THe 112 reminds me of GATRA. The table and fence will influence the precision of your cuts. A fence and guide rail that reaches out past the table will permit more extensive precise cuts.